Six miles in the snow, agreeable, mostly, apart from the descent from Seaford Head which was somewhat tricky. Fresh snow makes for easy running, and is probably very good exercise. And thus ends the first week of marathon training. Today was my last run as a free man. Tomorrow marathon training starts and I will be a slave to the programme until the evening of 5 May, when I shall sponge the mud from my knees and pour a large gin. I ran up to Fiveways from the Alfriston Road, and back by the golf club, a favourite route when I need six miles. 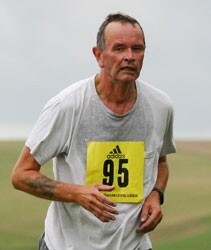 I was slow and stiff, perhaps as a result of yesterday's swimming, or the speed session with the Striders. A fresh north wind kept things cool, though the sun appeared from time to time. There was considerable mud in places, and I had to make my way round some of the larger stretches of mud, holding onto prickly bits of hedge. The only colour was provided by gorse flowers. In spite of spiritual preparation, by listing to Bach's cantata for Epiphany, Sie werden aus Saba alle kommen BWV 65, I failed to experience any manifestations during a five mile run on Seaford front. In fact it was very foggy. Like many young people of my generation I dabbled with hallucinogenic drugs, but never had the interesting hallucinations that others reported. I did once spend some time sitting on the banks of the Cam, under the influence of lysergic acid diethylamide, convinced that a flock of mallards had malevolent intentions towards me, but that was the limit. I never saw eternity in the creases of my trousers, not for want of trying. I wondered how my legs would cope, after a week of running, but they held up reasonably well. With a week to go, I ran today for ten miles in Friston Forest. On Good Friday I took part in the Good Good Friday Friday run. To deal with the latter first, it's an annual event that I last took part in in 2009. We meet at Brighton Marina, jog out to the wire fence by the water works opposite Telscombe The, and race back, about 3.75 miles each way. It was a fine afternoon, and the runners were fast, but I felt it no disgrace to be 24th out of 24 finishers, for many of them were very fast indeed. Today, I went out in drizzle, but quickly found the rain top I had put on too hot-making. I went on a loop through the forest, up to the hill above Jevington and back again beside the A259. At the top, I stopped for a drink and everything was quiet: the only sounds were the dripping of rain through the branches, and the faint pop-popping of guns in the distance. On the way back I startled an egret and heron, side by side in a pond near the Cuckmere. I feel ready for the marathon. I worry about my legs and my ankles, and which shoes to wear, and a hundred other things, but so one does this close to a race.